The name Valentine usually brings to mind sweet thoughts of someone you love. In Mary Campisi's Pulling Home, the name Valentine represents something so reprehensible and vile that most folks shun anyone associated with the name – most notably Audra since she reminds everyone of her late mother, Corrine, who lived a less than savory lifestyle – to the point that the name of Audra's father was never revealed. On the surface, Pulling Home, the first book of Campisi's, "That Second Chance" series seems like a story about a woman, Audra, who buries her husband only to learn her daughter, Kara, has a brain anomaly requiring surgery, all the while unable to forget a man from her past whom she hadn't seen for nine years, one of the few men who could provide hope for her daughter's survival. The story is so much more than that, though – so much deeper, with so many layers which continually get pulled back as the story unfolds. In Audra's quest to learn as much information about her daughter's medical history as possible, she must learn the identity of her father – a search which takes her on an unexpected journey of discovery where the lines are blurred between what is real and fabricated, where what seems delusional is, in fact, closest to the truth. Through it all, Audra has to deal with naysayers and people who are out to destroy her. No good thing seems to be said about her except by a family friend, Peter, who rallies to her side whenever she needs him, a man who loves her and her daughter without condition. The excerpts of gossip in this book as elderly ladies sit around on numerous occasions with nothing good to say was written so well that it turned my stomach, the same as I would shun such a scene in reality. I tried my best to read through these sections as opposed to skipping pages and I'm glad I did because they heard an earful when they least expected to hear it, and it didn't have to come from me. There were many twists and turns, many events unfolding, not to mention many tragedies I didn't expect to take place since Pulling Home is outside of the suspense/mystery/thriller genre. Many of the events which transpired I couldn't have predicted – which was great – though I'm proud to say I was able to discern who Audra's father would turn out to be. I looked forward to the discovery being made but the ensuing surprise made me feel robbed of a story I believe could have put Campisi in a league of her own. That being said, for the knowledge of Audra's father to become public knowledge would've been big; it would've shaken the foundation of the town, rocked several people and families to the core. Even so ... I continue to want more. “Things are not always as they seem.” You've heard the phrase several times and it's the common theme running throughout the story, fitting for every situation which occurred. Add to that the life lessons one carries away – to not judge others, to forgive and to uplift others in their time of struggle and need – and I'd have to say Pulling Home packs a wallop of a punch. In all honesty, I could likely write 10,000 words to convey my impressions of this book, if I was to pull apart all of the layers, events and emotions contained within the story. In fact, Pulling Home was a story so wonderfully knit together, stitch by stitch, that it is one I shall never forget. 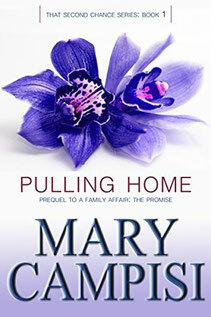 If you would like to learn more about this first book of Mary Campisi's "That Second Chance" series, feel free to check Pulling Home out on Amazon. You can also visit Mary Campisi's website to contact the author directly.